Backyard Poultry Medicine and Surgery is a practical resource offering guidance on developing diagnostic and treatment plans for individual companion poultry or small flocks. Organized by body system to aid in developing a differential diagnosis list for common presenting signs, the book provides all the information clinicians need to effectively treat backyard poultry. Written by experts from both the commercial poultry field and the companion avian field, the book provides thorough coverage of both common and less common diseases of backyard chickens, ducks, and other poultry. The book begins with introductory chapters covering general information, an overview of US laws, and basic husbandry concerns, then moves into specific disease chapters organized by system. The book takes an individual medicine perspective throughout, with photographs, radiographs, and histopathological photomicrographs to illustrate principles and diseases. 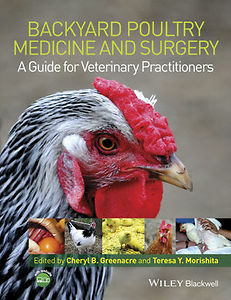 Backyard Poultry Medicine and Surgery is an invaluable guide to diseases and treatments for any practitioners treating backyard poultry.